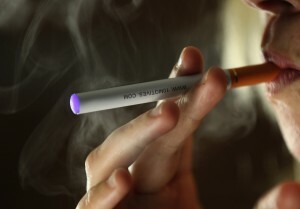 Can health insurers raise rates on e-cigarette users? Q. Can my insurer charge me a higher premium because I use electronic cigarettes? A. The rules aren’t clear, but some insurers may try to do so. Under the health law, insurers who sell plans on the individual market can take into account only four factors when determining someone’s premium: age, geographic location, family size and tobacco use. People who use tobacco can be charged up to 50 percent more than non smokers. Under the rules, use of any tobacco product four or more times a week on average in the past six months could subject someone to the tobacco surcharge. Ten states either prohibit or restrict insurers from applying the tobacco surcharge in the individual market, according to the Centers for Medicare and Medicaid Services. So are e-cigarettes tobacco products? The battery-powered devices simulate cigarette smoking, producing a smoke-like vapor that usually contains nicotine and flavoring agents. The Food and Drug Administration recently proposed regulating e-cigarettes, just as it does regular cigarettes and cigars. The Centers for Medicare and Medicaid Services is looking into the use of e-cigarettes and the tobacco surcharge, according to an agency official. In a recent review of research on e-cigarettes, researchers at the University of California-San Francisco found that, although the long-term health effects of e-cigarettes are still largely unknown, they emit potentially harmful substances into the air and can be a source of indoor pollution. The researchers also found that e-cigarettes actually reduce the likelihood that people will quit smoking, in contrast to advertising claims that firing up an e-cig will help people kick the habit. The potential role of e-cigarettes as a smoking cessation tool has insurance coverage implications too. The health law requires most health plans to cover FDA-approved smoking cessation products and counseling without any out-of-pocket cost to consumers. The federal government recently released guidance clarifying which services and products must be covered. Since e-cigarettes aren’t FDA-approved for quitting smoking–and in fact are considered by the agency to be tobacco products that warrant regulation like cigarettes—they aren’t covered as a free preventive benefit under the law.